Vivia Chen is on vacation. Guest blogger and Corporate Counsel editor in chief Anthony Paonita is filling in. Being a New York-based legal magazine editor is a tough job. Coaching writers through stories over lunch, trips to conferences in nice locales, and a whirl of cocktail parties are enough to make a guy head for a Zen retreat. Okay, I lied about the parties. Anyway, over after-work drinks at a midtown steakhouse I talked to Helen Wan, an associate general counsel at Time Inc. We did the New York thing of promising to have lunch sometime—and we actually did just a couple of weeks later, which has got to qualify as some kind of record. Wan, who is the primary in-house attorney for Time’s lifestyle magazines (think Coastal Living and Real Simple) is a good lunch companion, with a lively sense of humor and wide-ranging interests. After putting in a couple of years at Paul, Weiss, Rifkind, Wharton & Garrison, Wan moved to Frankfurt Kurnit Klein & Selz, a boutique media and advertising firm. There she was able to focus on her passion, media and publishing, as a junior associate. 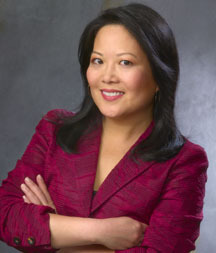 As if her day job weren’t enough, Wan has finished a novel that’s tentatively titled The Firm Outing, which will be published in May 2013 by St. Martin’s Press. Here’s an edited version of our conversation. You have a pretty interesting job. What’s a typical day like? It runs the gamut. It can range from dealing with a writer agreement negotiation, or a meeting with clients. A photo rights issue might come up. Sometimes there’s a marketing initiative, and we have to vet those for compliance. We hold meetings with the editorial staff to talk about best practices. You took a detour from law, didn’t you? I had left Paul Weiss after two years. It was around my seventh year practicing law. I was at the boutique firm for about five years. My husband got a job in Texas. I wanted to write a book, so I took a leave of absence. We thought we’d have to relocate. I always knew I wanted to write one, but being a junior associate, I didn’t have much time. It was always a dream of mine, so I thought, “hey, here’s my chance.” As it turned out, we never had to move. He found another job, at New York University. But my leave had already started, so I decided to write. Was not having to go to work, and to sit and write a big adjustment? It was hard to not to be expected anywhere. We lawyers are used to getting up and getting dressed appropriately every day. You’ve got a phone ringing, a BlackBerry, assistants doing stuff for you. I found it a difficult transition. So I decided not to work at home. I actually started writing at the New York Public Library, the Rose reading room. I treated it like a job. When you’re a practicing lawyer, you think what a dream it is to sit and write. But when you’re faced with that reality, it leaves a void, it’s such a solitary activity when you’re used to being around smart grownups. I didn’t just write it during that leave. On and off, it took me nine to ten years. The story changed so much over time. I was writing it all the time in bits, on weekends. I’d save up my vacation and make them writing vacations. So when I took my leave, I was revising and polishing. How are you getting the novel published? I have an agent, who I found the old-fashioned way—researching agents, going to networking events, pitching my work through an unsolicited query letter. I signed up for a “How to Pitch to Agents” event, open to the public. I had five minutes to describe my book idea to Josh Getzler, and left the first five pages with him. He emailed me, asking to see the whole manuscript. A few weeks later, he offered representation. It’s a story of a young woman of color up for partner at a very, very, big, high prestige law firm. She encounters a glass ceiling and it’s about what she does about it. Really, it’s about an outsider basically learning the rules of survival in a world where its very, very, important to be on the inside. I tried to write this book with a light and comic touch, although—given the subject matter, diversity and meritocracies in today’s big American law firm, with everyone playing to win—of course it is also by turns serious. But not overly so, I hope! The book definitely ends on a positive note and has an overall optimistic outlook. What made you write a novel on this subject? There wasn’t any one incident, it was nothing that happened to me. When you move to New York City and become a young lawyer, you observe situations, clients, gatherings. You notice patterns of success and failure emerge. Especially as a young Asian lawyer, a lot of what we learned—keep your head down, for example—that’s the wrong advice. Young lawyers, not just women, get to their first job believing in the meritocracy and not understanding unwritten rules. My editor asked what made you write this book? They always say write the book you’d like to find. There were no books about young minority lawyers having to learn the rules. No one’s giving you a decoder ring, and that’s what you need. This is different from your personal experience? I was lucky. Being a writer I was an observer, I learned just by looking around. It’s important to get to know people and not just be the automaton and not being visible. I was lucky to have a great group of friends from everywhere I worked. I never felt I was a victim of invidious discrimination.